There is a school named 『Girin Arts High School’ which only teaches students how to dance and sing. The director (Bae Yong Joon) and fellow teachers (Park Jin Young, Um Ki Joon, Lee Yoon Ji and Lee Byung Joon) operate the school. If the students are found to be lackadaisical and practicing in a lazy manner, the teachers may shoot fire from their mouths. There is also a secret… the majority of stars you see on TV are graduates of this school. For the upcoming year, 2011, there is a feeling that a group of special students might be entering into the school. 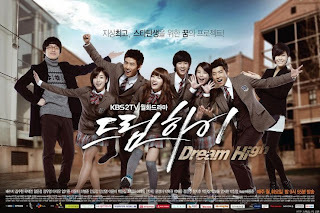 … 「Dream High」 will broadcast its first episode on January 3rd, 2011. English sub: http://www.megaupload.com/?d=UAXL78JK *thanks to onionring!